"Yes," Netanyahu told reporters, when asked if he was going to meet with Saudi officials at the conference. Israel and Saudi Arabia have never established official diplomatic relations. The two countries, however, are both engaged in a power struggle with their common enemy — Iran — for influence in the region. "Several ministers from leading Arab countries… [believe] with complete unity and understanding that major threat to peace and security is Iran, Iranian regime. There is a solidarity that I don't remember in my life. We can unite against a common threat," Netanyahu added. The international summit opened in Poland on Wednesday and will last through Thursday. 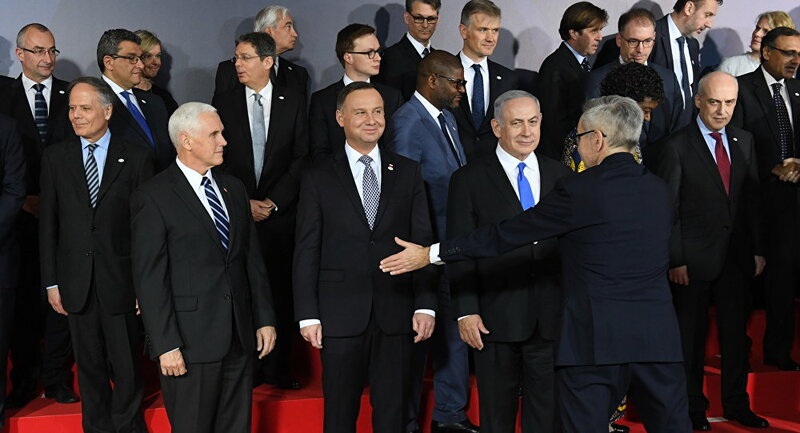 The Israeli prime minister is the only leader attending the event, dubbed the Ministerial to Promote a Future of Peace and Security in the Middle East. US Vice President Mike Pence and Secretary of State Mike Pompeo participate in the conference as well, since the summit has been organized at Washington's initiative. Apart from Israel and the United States, the conference is also attended by the representatives of Bahrain, Egypt, Jordan, Kuwait, Morocco, Oman, Saudi Arabia, Tunisia, the United Arab Emirates and Yemen. Meanwhile, such major actors as Iran, Russia and Turkey have skipped the event. The international meeting is widely considered to be a US attempt to build an anti-Iran alliance and extent sanctions against the country.